Whether you're refinishing a vintage dresser or woodwork on the outside of your home, a heat gun makes quicker work of what might otherwise become a labor-intensive, time-consuming task. Read on for a few pointers on using the tool safely and effectively. Looking for a quick way to remove old layers of paint? 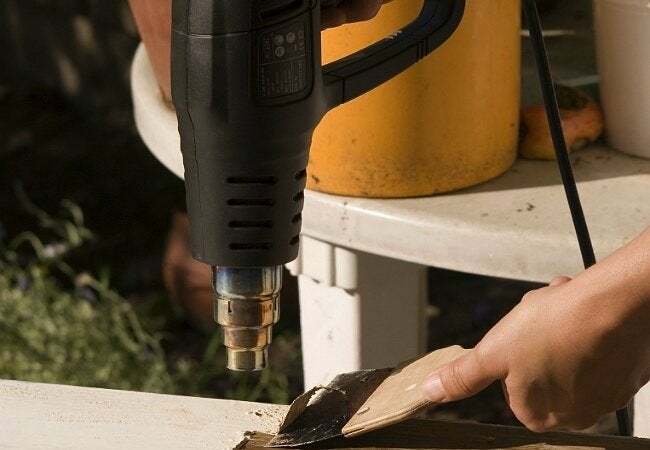 Your best bet might be a heat gun—and it’s easy enough to use one, so long as you make safety a top priority. To heat only one painted area and not its surroundings, consider crafting a simple heat shield. Here, cut a hole in a piece of cardboard, making the hole a tad larger than your target. Cover the cardboard in heavy-duty aluminum foil, then get to work. Having readied the heat gun, run it over the old paint in a continuous sweeping motion, keeping the nozzle of the gun about two inches above the painted surface. When the paint begins to release from the surface, use an angled paint scraper to peel away the old paint. Have a trash can handy and wipe off the scraper every minute or two. Above all, avoid distractions! Even a momentary lapse in concentration can lead to serious injury. Remember to wear long sleeves and safety glasses when you’re doing the job, and keep a fire extinguisher close at hand.